In the summer I get the urge to sew but there really wasn’t anything I wanted or needed to sew. Plus it hasn’t been unbearably hot very often so I was able to knit on some of my bigger projects that have been neglected. Then we did a summer reading program at our local library during July. Little Man got a cute plastic bag with the theme of the reading program on it but it wasn’t long before the book corners had stabbed the bottom of the bag full of holes. So I decided to make him a tote bag for his books. 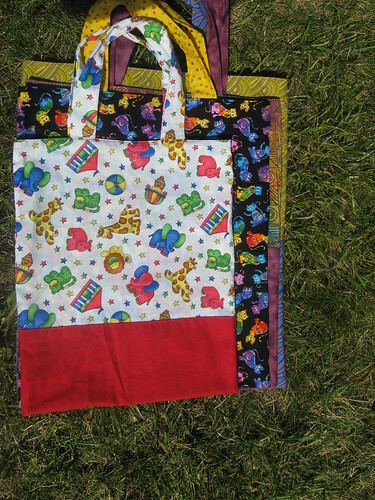 I had fun making it so I decided that not only did he need a bag but my grandma needed some bags. So over the past month whenever i got the urge to sew. I made a bag. Little Man’s, Both of my grandma’s in the middle and then mine. Little Man’s fabric was on clearance and Joann’s awhile back. My grandma really likes Batik fabrics so I got those at a local fabric store for her. Little Man picked out the cat fabric for my grandma’s second bag. I was only going to make her the Batik one but he really wanted her to have a cat one too and really you can never have to many tote bags 🙂 The fabric for my bag was on clearance at the local fabric store awhile back and I had liked it instantly. 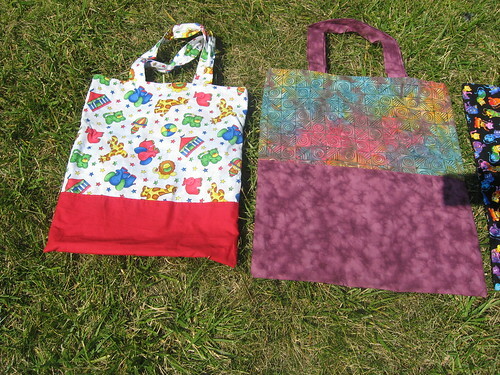 The bags are reversible if you want them to be. 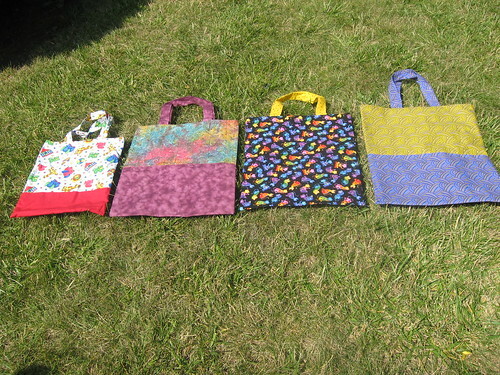 So here are the insides of the bags, still in the same order as before. 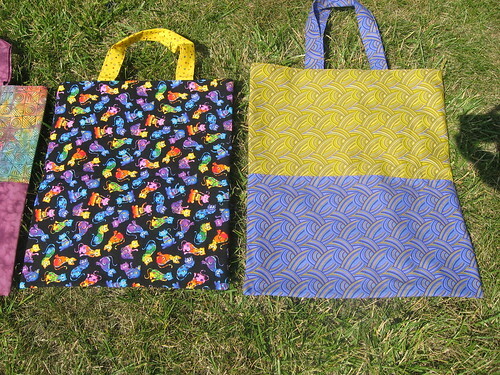 I made the bags by combining two patterns. 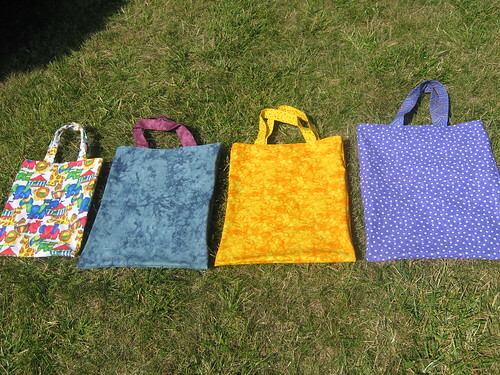 One from Simple Sewing by Lotta Jansdotter and this tutorial. Aside from Little Man’s bag I let the size of the cut of fabric decide how big the bags would be. I am very happy with them. Grandma got her bags today in the mail and was very happy with them as well.